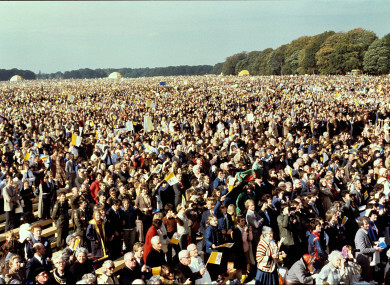 It is estimated over a million people attended the mass in the Phoenix Park by Pope John Paul II in 1979. JUST UNDER HALF of people said that they’d like to attend a mass by Pope Francis, if one takes place when he visits Ireland next year. In a survey of 1,000 Irish adults by Ámarach Research for RTÉ’s Claire Byrne Live, 47% of people said they would like to attend a mass given by the pope. While 12% said they didn’t know either way, 41% of people said they wouldn’t like to. Although it has been confirmed that Pope Francis will be coming to Dublin for the World Meeting of Families in August 2018, little about his itinerary has been made publicly available yet. Speaking on RTÉ’s Today with Sean O’Rourke earlier this week, Archbishop Diarmuid Martin said that it was likely that the pope would hold a mass in the Phoenix Park, just like Pope John Paul II did in 1979. The pope’s advancing age – he’s now 81 – would mean his itinerary would not be as packed as John Paul II’s was in 1979. “We had over one million in the Phoenix Park [for Pope John Paul II],” Martin said. “But we’re not looking at numbers, we’re looking at the quality of events. He’d like to go to a prison. Everywhere he goes, he goes to a prison. He’d like to see and meet people who are experiencing poverty, so I imagine something for the homeless. I’d like him to meet with the travellers too. Show solidarity. Email “Would you like to attend a mass by Pope Francis during his Irish visit? Here's what people said...”. Feedback on “Would you like to attend a mass by Pope Francis during his Irish visit? Here's what people said...”.